Pleeeeeese make it work on the new infograph watch face on the Apple Watch 4 showing humidity and pollen levels. It would make it truly useful on this device. Thanks for updating to iPhone X, fantastic. Now then, I’ve taken to using it on my Apple Watch, great App as you would expect. However, I cannot change the wind speed to mph from stupid kilometres!! In the UK all the road signs are in miles not kilometres and until that changes (not likely now thanks to ludicrous brexit vote) I use miles as my reference. I can use mph on the iPhone app but not the Watch. Sticking with the fantastic Watch app, it would be nice whilst on the precipitation screen that rotating the Digital Crown one could view the rain forecast animation forecast just as on the iPhone. 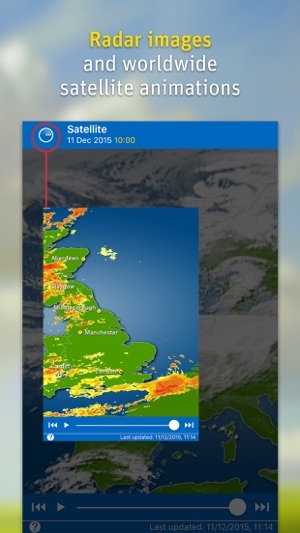 I don’t do subscription apps but I make an exception for this one to view the rain radar forecast. STILL THE BEST WEATHER APP EVER! After all these years it's still way ahead of the game. If you want to know exactly when the rain will start and end just look at the radar. I'm a bit of an astronomer and the weather forecast is critical to me. 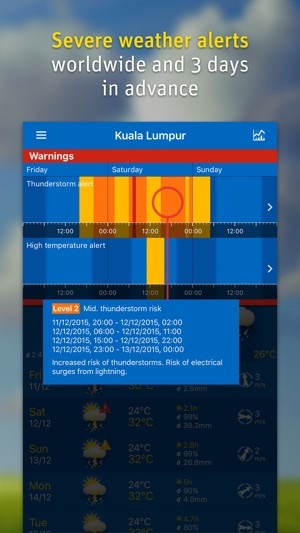 Had this app since its release, along with every other weather app. Use it on my iPad and iPhone and it's the best by a long way. 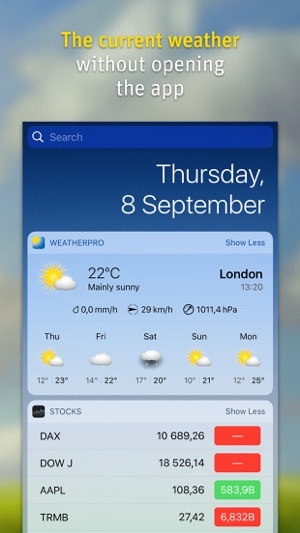 All I need it to do now is integrate with SIRI on my iPhone 4s so it can replace the default weather app on it. 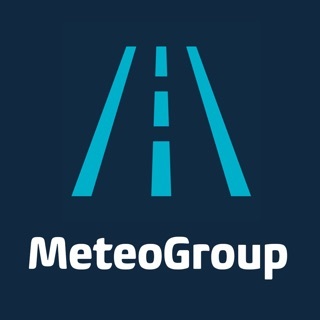 I've been using this app for five years as enhancement to the commercial meteorological information provided for our flight planning at work (as an airline pilot) and it is useful and reliable. To be able to see up to date dynamic lightning strike info and precipitation radar is a great help. I wish it had greater world coverage with radar/precipitation dynamic display-at the moment it only really covers Europe. For local weather planning for activities it is of great benefit-we camp a fair bit and it has made a big difference with booking and planning in the last ten days prior to a trip. 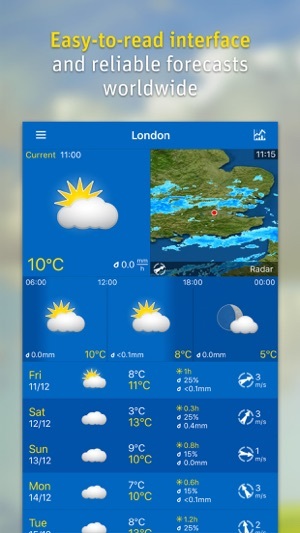 The graphical display is clear and the quality of the information is good-of course, like all weather forecasting it can vary in difficult forecasting scenarios, however I have found it is the best available-especially compared to the phone supplied apps. Certainly worth the yearly subscription in my humble opinion. 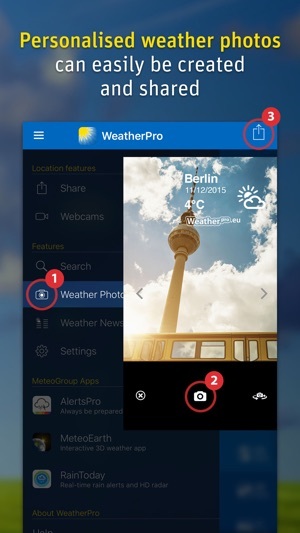 Seems to work and has most of what I need in a user interface that’s better than MeteoBlue. so it declutters the display and allows me to focus on the forecast I’m interested in - I’m not going to be on a hill in the dark !